The Accurate, Fast Way to Migrate, Archive & Analyze Email Data. Choose Aid4Mail for Windows when you need to migrate email accounts quickly and reliably… When you’re under pressure to process email data for litigation purposes… And when you can’t afford to risk losing or compromising email data. Easily transfer messages between email apps and web-based services. For example from Thunderbird to Outlook, or Eudora to Office 365, or Yahoo to Gmail. More than 40 programs and services supported. Are you regularly archiving your mail? If not, your valuable messages are at risk. Every day, thousands of email accounts like yours are hacked and deleted. Don’t wait until it’s too late! A good email e-discovery tool needs to accurately handle large volumes of mail, filter and deduplicate messages, and save results to a variety of popular formats. Find out why Aid4Mail fits the bill. 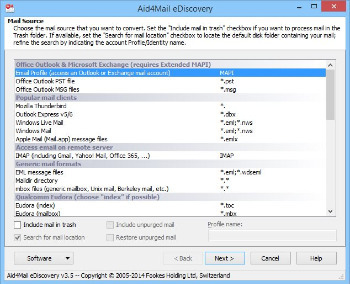 You need an accurate tool that supports a large variety of formats, can read mailboxes disconnected from their email client, and can extract deleted messages. See why Aid4Mail is a good choice. Aid4Mail runs under Windows 10, 8, 7, Vista, XP, 2000, Server 2012, 2008 and 2003 or Linux in conjunction with Wine. Both Windows 32-bit and 64-bit are supported. Windows NT4 / ME / 98 / 95 should work but are not officially supported. • Fixes an issue occurring under Outlook 2016 32-bit with emails based on Unicode character sets. Under these conditions, email messages exported to Outlook have their message text truncated. • Fixes an issue selecting a delegated store name that has diacritic characters. Note: You can switch between editions under Software – Test Features of – Mode Choice. Automatically will load up in Professional Mode, you can switch from the menu to Home, Migrator, Site, Archivist, eDiscovery, Forensic, Service.